Mercosur’s purpose is to promote free trade and the fluid movement of goods, people, and currency. It currently confines itself to a customs union, in which there is free intra-zone trade and a common trade policy between member countries. The official languages are Spanish, Portuguese, and Guarani. Since its foundation, Mercosur’s functions have been updated, amended, and changed many times: it is now a full customs union and a trading bloc. 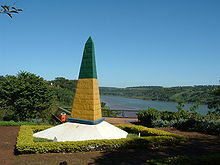 Mercosur was established in 1991 by the Treaty of Asunción, which was later amended and updated by the 1994 Treaty of Ouro Preto. 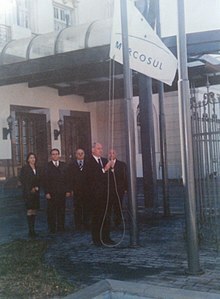 Mercosur originated in 1988, when presidents Raúl Alfonsín of Argentina and José Sarney of Brazil signed the Argentina-Brazil Integration and Economics Cooperation Program or PICE (Portuguese: Programa de Integração e Cooperação Econômica Argentina-Brasil, Spanish: Programa de Integración y Cooperación Económica Argentina-Brasil). The protocol Number 20 of the program also proposed the Gaucho as a currency for regional trade. After suspending Paraguay in 2012, the presidents of the Mercosur countries (Argentina, Brazil, Uruguay, and Venezuela) said in July 2013 that they would lift the suspension after the inauguration of Paraguay’s newly elected President, Horacio Cartes, on 15 August 2013. However, Paraguay said it would not return to the Mercosur fold as long as Venezuela held its rotating presidency. Venezuela held Mercosur’s rotating presidency until July 2014. Paraguay has objected to Venezuela’s inclusion in the trading bloc, and says that a new member can only be included after a unanimous vote and argues that such a vote should not have been held while Paraguay was suspended. Foreign Minister Eladio Loizaga said he would rather deal with Paraguay’s neighbours individually at first. “We have pending issues with Argentina, with Uruguay; we have to recompose all that,” he said. “Mercosur will be later because our priority are [sic] the bilateral relations,” he added. On 7 December 2012, Bolivian President Evo Morales signed a protocol aimed at accession to full membership of the block. Such a proposal requires review and possible legislative approval. On July 7 of 2015, the heads of Mercosur having decided to accept Bolivia’s request to become a full member country, Bolivian president Evo Morales signed the Brasilia protocol. This acted as Bolivia’s full membership to the Mercosur. In August 2016, the presidents of Brazil, Argentina, and Paraguay, while present in Rio de Janeiro for the Olympic Games, met to discuss suspending Venezuela from Mercosur. The three countries were in doubt about whether Venezuela was complying with the union’s requirements for full membership, citing human rights violations among other issues. In fact, Venezuela was rejected from assuming the presidency of Mercosur by those three countries, prompting a dispute that continued in full throttle to the end of the year. On 21 November 2016, Paraguayan Foreign Minister Eladio Loizaga announced that Venezuela would be suspended in December 2016 after the nation was given a three-month period to reform its laws to abide to Mercosur requirements, with Mercosur noting that “rules governing trade, politics, democracy and human rights” needed to be overhauled in Venezuela. On 1 December 2016, Venezuela was suspended from Mercosur. The region is highly urbanized, and the largest cities in Mercosur are the global cities Buenos Aires, Rio de Janeiro and São Paulo. The white population is the majority in Argentina and Uruguay and represents around half the population in Brazil. Mestizos form the majority population in Paraguay. All Mercosur nations have significant Native American populations, especially in Paraguay (Guaraní is a national language in the country along with Spanish, and almost all Paraguayans have Guaraní genetic ancestry), Argentina (especially in the country’s North-Western, Northern, and Southern provinces), Brazil (in the Northern Amazonian states of the nation, where Native American tribes have vast reservation lands). Intra-Mercosur merchandise trade (excluding Venezuela) grew from US$10 billion at the inception of the trade bloc in 1991, to US$88 billion in 2010; Brazil and Argentina each accounted for 43% of this total. The trade balance within the bloc has historically been tilted toward Brazil, which recorded an intra-Mercosur balance of over US$5 billion in 2010. Trade within Mercosur amounted to only 16% of the four countries’ total merchandise trade in 2010, however; trade with the European Union (20%), China (14%), and the United States (11%) was of comparable importance. Exports from the bloc are highly diversified, and include a variety of agricultural, industrial, and energy goods. Merchandise trade with the rest of the world in 2010 resulted in a surplus for Mercosur of nearly US$7 billion; trade in services, however, was in deficit by over US$28 billion. The EU and China maintained a nearly balanced merchandise trade with Mercosur in 2010, while the United States reaped a surplus of over US$14 billion; Mercosur, in turn, earned significant surpluses (over US$4 billion each in 2010) in its trade with Chile and Venezuela. The latter became a full member in 2012. Mercosur/Mercosul’s flag in the city of Brasília, Brazil. Directly subordinated to the Common Market Group, the Work Subgroups draw up the minutes of the decisions to submit for the consideration of the Council, and conduct studies on specific Mercosur concerns. The work subgroups are the following: commercial matters; customs matters; technical standards; tax and monetary policies relating to trade; land transport; sea transport; industrial and technology policies; agricultural policy; energy policy; coordination of macroeconomic policies; and labor, employment and social security matters. meetings. The meetings of the Work subgroups will be held quarterly, alternating in every member state, in alphabetical order, or at the Common Market Group Administrative Office. Activities will be carried out by the Work Subgroups in two stages: preparatory and conclusive. In the preparatory stage, the members of the Work Subgroups may request the participation of representatives from the private sector of each member state. The decision-making stage is reserved exclusively for official representatives of the member states. The delegations of representatives from the private sector in the preparatory stage of the Work Subgroup activities will have a maximum of three representatives for each member state directly involved in any of the stages of the production, distribution or consumption process for the products that fall within the scope of the subgroup’s activities. The Committee will have both an advisory and decision-making nature; with powers to submit proposals as well. It will be competent, inter alia, to: follow up on the integration process and keep the respective Congresses informed; Take the necessary steps for the future instatement of a Mercosur Parliament; Organize subcommittees to examine matters relating to the integration process; Submit its recommendations to the Common Market Council and Group as to how the integration process should be conducted and Southern Common Market formed; Make the adjustments necessary to harmonize the laws of the different member states and submit them to the respective Congresses; Establish relationships with private entities in each of the member states, as well as international agencies and bureaus so as to obtain information and specialized assistance with matters of interest: Establish relationships targeting cooperation with Congresses of the nonmember nations and entities involved in regional integration schemes; Subscribe to cooperation and technical assistance accords with public and/or private entities whether domestic, supranational or international. The Committee will be composed of a maximum of 64 acting parliamentary members, 16 per member state, and an equal number of alternates, appointed by the Congress to which they pertain, and with a term of office of at least two years. The meetings shall be conducted by a directors’ board consisting of four presidents (one for each member state). The Committee will ordinarily meet twice a year, and extraordinarily whenever summoned by any of its five presidents. Meetings are held in the territory of each member state on a successive and alternating basis. Decision Making: Meetings of the Joint Parliamentary Committee will only be valid when attended by parliamentary delegations from all member states. Decisions by the Joint Parliamentary Committee will be made by consensus vote of the majority of the members accredited by the respective Congresses of each member state. Portuguese and Spanish are the official languages of the Joint Parliamentary Committee. The Trade Commission will assist the Mercosur executive body, always striving to apply the instruments of common trade policy agreed to by the member states for operation of the customs unification. The commission should also follow up on the development of issues and matters related to common trade policies, the intra-Mercosur trade and trade with other countries. The Commission will have five actual members and four alternates, with each member nation’s indicating a member. The Trade Commission shall exert every effort to apply common trade policy instruments such as: trade agreements with other countries or international entities; administrative/commercial product lists; final adaptation system for Mercosur customs unification; rrigin system; free-trade zone system, special customs areas and export processing zones; system to discourage unfair trade practices; elimination and harmonization of tariff restrictions; nonmember country safeguard systems; customs coordination and harmonization; consumer protection systems; and export incentive harmonization. The member nations can have commercial free-trade zones, industrial free-trade zones, export processing zones, and special customs areas, all of which target providing merchandise marketed or produced in these areas with treatment different from that afforded in their respective customs territories. Uruguay’s Vice-President Danilo Astori said the issue of a free trade agreement with the United States must be dealt and that “opportunities must be built”. He also said that “each Mercosur country should have a multiplicity of memberships. Mercosur must have joint international policies, an agreement on moderate protection from third parties and above all must have agreements with other trade blocks”. In the event of the producing nation’s granting special incentives for production from the free-trade zones that are not compatible with the corresponding guidelines established under the General Agreement on Tariffs and Trade (GATT), the member nation can make any adjustments needed to return the situation to equilibrium. The member nations agreed that any free-trade zones that in August 1994 were already in operation could operate normally under Mercosur, along with any that are set up in light of legal guidelines prevailing or in course in congress during this same time period. This means that a member nation can no longer create new free-trade zones that are more privileged. Mercosur is an effective agreement for its members. The nation receiving the investment cannot avail itself of unjustified or discriminatory means capable of restricting the investor’s freedom to manage, maintain, use, enjoy and dispose of its investments. ^ a b “Informe Latinobarómetro 2011” (PDF). Latinobarómetro. p. 58. ^ a b c “World Economic Outlook Database”. IMF. April 2012. ^ “Report for Selected Countries and Subjects”. www.imf.org. ^ a b “Mercosur welcomes Venezuela, suspends Paraguay”. Reuters. 29 June 2012. ^ “De West – Suriname en Guyana officieel Geassocieerd Lid Mercosur -“. 20 July 2015. Retrieved 2 December 2016. ^ “Se formaliza adhesión de Venezuela al Mercosur”. Ministerio de Relaciones Exteriores de la República Bolivariana de Venezuela. Archived from the original on 30 January 2016. Retrieved 22 November 2013. ^ “Presidentes dos países do Mercosul se reúnem para discutir integração do bloco”. Governo do Brasil. Retrieved 23 November 2013. ^ “Buscar”. Mercosur.int. Archived from the original on 25 December 2013. Retrieved 25 December 2013. ^ “Tratado de Integración, Cooperación y Desarrollo entre Brasil y Argentina”. .uol.com.br. Retrieved 2013-12-25. ^ “Protocolo No. 20” [Protocol Number 20] (PDF). integración latinoamericana (in Spanish). 12 (129): 67. November 1987. Retrieved 2017-07-19. ^ “Protocolo Constitutivo del Parlamento del Mercosur (article 24)” (PDF) (in Spanish). December 9, 2005. Retrieved 2017-07-19. ^ a b “Paraguay’s President Horacio Cartes sworn in”. BBC News. ^ “Instituto Boliviano de Comércio Exterior critica entrada do país no Mercosul”. Terra.com. Retrieved 23 November 2013. ^ “Petrobras vale dez vezes o PIB da Bolívia”. Globo.com. Retrieved 23 November 2013. ^ “MERCOSUR – Bolivia ingresa al MERCOSUR”. Retrieved 2 December 2016. ^ “Venezuela’s Mercosur Membership is in Peril”. Stratfor. August 8, 2016. Retrieved November 23, 2016. ^ “Argentina, Brazil, Paraguay Dispute Venezuela as Mercosur Head”. Telesur. August 4, 2016. Retrieved November 23, 2016. ^ “Venezuela suspended from Mercosur beginning December”. Agence France-Presse. 21 November 2016. Retrieved 27 November 2016. ^ a b c “Mercosur suspends Venezuela for failure to follow rules”. Associated Press. 2 December 2016. Retrieved 2 December 2016. ^ “Bolivia to join Mercosur as full member – Rousseff”. 17 July 2016. Retrieved 2 December 2016 – via Reuters. ^ “Venezuela tendrá cuatro años para adaptarse a normativa comercial del Mercosur”. Telesur. 31 July 2012. ^ “Countries of the world ordered by land area”. ^ a b “El Mercosur hoy, a 20 años de su constitución”. Fundación EGE. Archived from the original on 4 March 2016. ^ a b c d e f g “Mercosur–EU Bilatral Trade and Trade with the World” (PDF). DG Trade. March 2012. p. 6. ^ “Entra Venezuela al Mercosur”. BAE. Archived from the original on 8 May 2013. ^ a b “Country Comparison:Exports”. The World Factbook. CIA. 2011. ^ por fernandoneves. 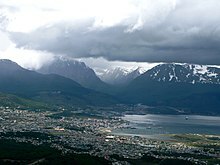 “List of the best universities in Latin America”. Rankz.wordpress.com. Retrieved 2013-12-25. ^ “University of São Paulo is the best university of Brazil”. Universia.com.br. 14 February 2005. Archived from the original on 29 July 2010. Retrieved 2013-12-25. ^ “Uruguay calls on Mercosur to sign a free trade agreement with United States”. bilaterals.org. Retrieved 2013-12-25. ^ Hardman Reis, T. (2005). “Aspectos Jurídicos da Criação de um sistema monetário para o Mercosul”, Hardman Reis e Gomes Eduardo (Coord.) Globalização e Comércio Internacional no Direito da Integração. São Paulo, Ed. Lex/Aduaneiras, p. 235. ^ Klonsky, Joanna; Hanson, Stephanie (20 August 2009). Mercosur: South America’s Fractious Trade Bloc. Council on Foreign Relations. ^ Garces, Raul O. (6 August 2009). Uruguay: Ex-dictator’s son says quit Mercosur. Associated Press. ^ “Common Foreign Policy / CAN – Mercosur – Andean Community”. Web.archive.org. Archived from the original on 7 April 2005. Retrieved 2013-12-25. ^ “Mercosur signs first out of region trade accord with Israel”. Mercopress. Archived from the original on 20 December 2007. Retrieved 2007-12-21. ^ “Argentine Commerce Secretary (in Spanish)”. August 2010. Archived from the original on 26 December 2013. ^ “Uruguay Investments and Exports Promotions”. December 2010. ^ “Lebanon signs Latin American free trade pact”. Retrieved 2 December 2016. ^ “Macri and Temer agree to open Mercosur and to closer ties with Mexico”. Retrieved February 8, 2017. ^ “Mercosur suspends Venezuela, urges immediate transition”. Reuters. 2017-08-05. Retrieved 2017-08-05. ^ “Nova Zelândia quer tratado de livre comércio com Mercosul”. Federal Senate of Brazil. Archived from the original on 22 April 2013. Retrieved 22 November 2013. ^ “Guyana-Mercosur Framework Agreement” (PDF). Mercosur. Retrieved 23 November 2013. ^ “Suriname-Mercosur Framework Agreement” (PDF). Mercosur. Retrieved 23 November 2013. ^ “Quienes Somos”. Mercosur. Archived from the original on 24 October 2013. Retrieved 23 November 2013. ^ “Tratados, protocolos e acordos firmados após julho de 2012”. Mercosur. Archived from the original on 21 October 2013. Retrieved 23 November 2013. Rivera, Salvador. “Jacob K. Javits and Latin American Economic Integration.” Cuaderno de Negocios Internacionales e Integración.” 13 no. 64/65 July–December 2007.